Is New York State Really a Great Job Creator? New York state government is spending its taxpayer's money advertising 10 areas near state universities into which a new company or an out-of-state company can move and pay no taxes for 10 years, provided the government likes your business and is given significant controls over your business. Mostly New York's Democrat Socialist Party controlled government likes certain high technology companies, such as biotechnology companies. They do not like the vast majority of businesses, at least not enough to give them any tax breaks. Indeed, most businesses have to be taxed heavily so that the few anointed companies can be lured into the high tax trap of New York and so such advertising can be carried out in Maryland and Oklahoma and many another state. Even more expensive is the huge welfare state apparatus of New York state. The only way to fund that redistribution of income is to tax both businesses and better paid persons heavily. Among the claims in the ad, New York state government claims it has created 400,000 jobs. They neglect to say over what time period and whether these are net jobs or these are all new jobs with any lost jobs ignored. The high tax and heavily regulated state of New York is undoubtedly very good at killing jobs, so it is perilous to ignore the jobs destroyed. According to the Bureau of Labor Statistics, the non-farm seasonally adjusted establishment job tally of private sector jobs increased in New York state from March 2013 to March 2014 by 103,500. So maybe the 400,000 jobs were net jobs since the depth of the never-ending Great Socialist Recession. They were not recently created net jobs. I have ignored any added government jobs since such jobs would only create greater burdens for any private sector company moving to New York. New York claimed that the 400,000 jobs were the second largest number of jobs created in any state in the US. In 2010, New York state was the third most populous state, so just to stay even on jobs, it would likely have to produce at least the third most jobs. Actually, New York state has a population growth estimated from 1 April 2010 to 1 July 2013 of 1.4%, which lags the population growth of 2.4% of the nation as a whole. What is more, a larger fraction of its population is over 65 years old and a smaller fraction is under 18 years old. There seems to be no rush of people into New York state owing to good jobs, despite the huge sums of bailout money that the federal government has dumped into New York City and its financial institutions. That bailout in the form of quantitative easing continues to this day. There were 26 states in which a higher percentage private sector job increase occurred compared to the 1.45% increase in New York. This is not such a remarkable achievement by New York as it is represented to be in its ubiquitous ad. The New New York is not so very different. It is North Dakota that is the jobs creation giant, albeit in percentage terms only. 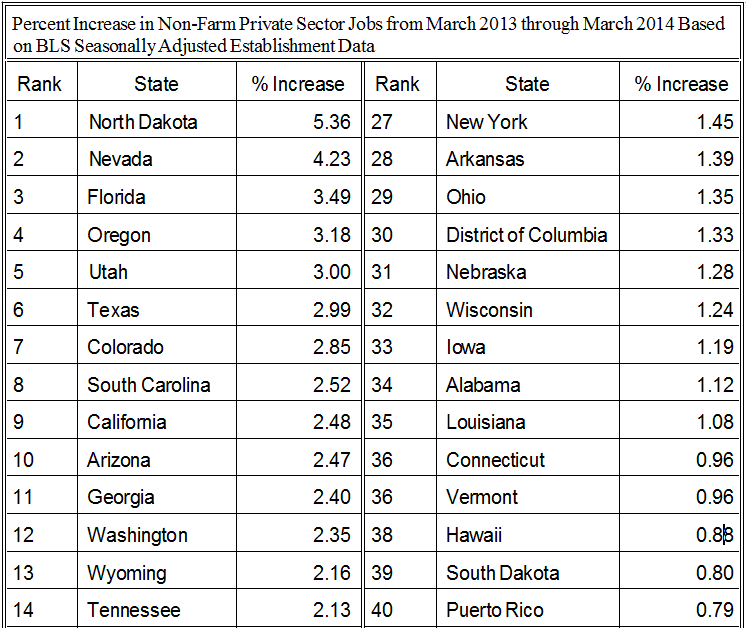 Six states have had private sector job growth rates more than twice that of New York state. In fact, we can see that in this recent period, the claim that New York created the second most jobs in number is clearly wrong. The population of the state of Texas is greater than that of New York and its job increase of 2.99% clearly means it added many more jobs than did New York. The population of Florida is about the same as that of New York, so its job increase of 3.49% also means more jobs were created in Florida than in New York. So, in this time period, at least two states added more jobs than New York did. The New York state government is running an ad which is very misleading. There may be some convoluted manner in which it is not a literal lie, but it is surely a serious attempt to mislead the People. The employment increases in the table above allow us to make a few interesting comments about some other states and the possible presidential prospects for their governors. Note that Gov. Rick Perry's state of Texas is still tearing up the racetrack in creating jobs with a 2.99% increase between March 2013 and March 2014. On the other hand, Gov. Chris Christy of New Jersey heads a state government where the private sector job increase is essentially zero at 0.07%, the next to the worst record of any state. Gov. 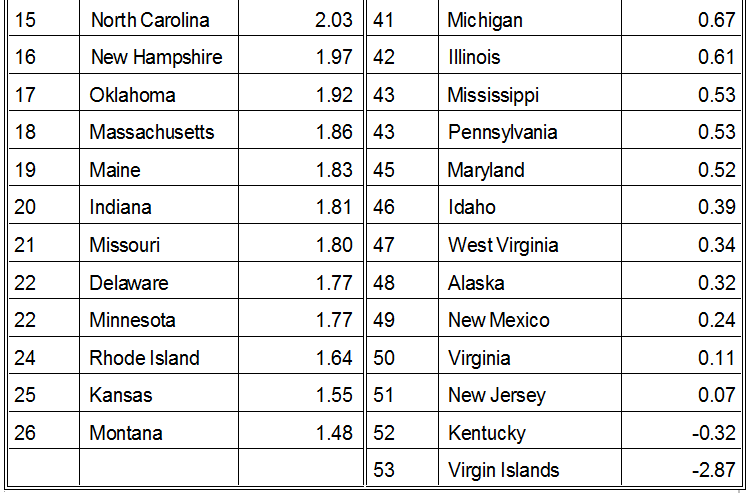 Scott Walker of Wisconsin has a state with a 1.24% increase, a 32nd ranking counting DC, but at least greater than the population growth in that time. Gov. Bobby Jindal of Louisiana has a state that is not doing great in the business of job creation either at 1.08% increase and a rank of 35. On the Democrat Socialist Party side, Gov. Martin O'Malley of Maryland earns his moniker of O'Folley with 40 straight tax increases, a job increase of only 0.52%, and a ranking of 45. Maryland's population since April 2010 is estimated to have grown by 0.90% a year, so Maryland is not keeping up with the population growth with its meager 0.52% increase in jobs. I marvel at the ability of some governors to seek higher office when they have not demonstrated that their states can create private sector jobs. The People should be paying attention to this. I will acknowledge that some of these states were basket cases and it will take several good governors to allow private industry to turn the states around. Their state governments have bollixed up the state economies for a very long time in many cases. The damage done can take a long time to correct and the healing process can take time. Yet, when good government policies are established, some great results often occur quickly. The engine of growth is in the private sector, but governments have to stop stuffing the gas tank with sand and sugar. The fraction of the American non-institutionalized population over 16 which is employed has risen somewhat through April 2014 from a downward drop in the latter half of 2013. However, this all-critical employment to population ratio is still well below the already very low ratio when he first took the oath of office of the presidency in January 2009. 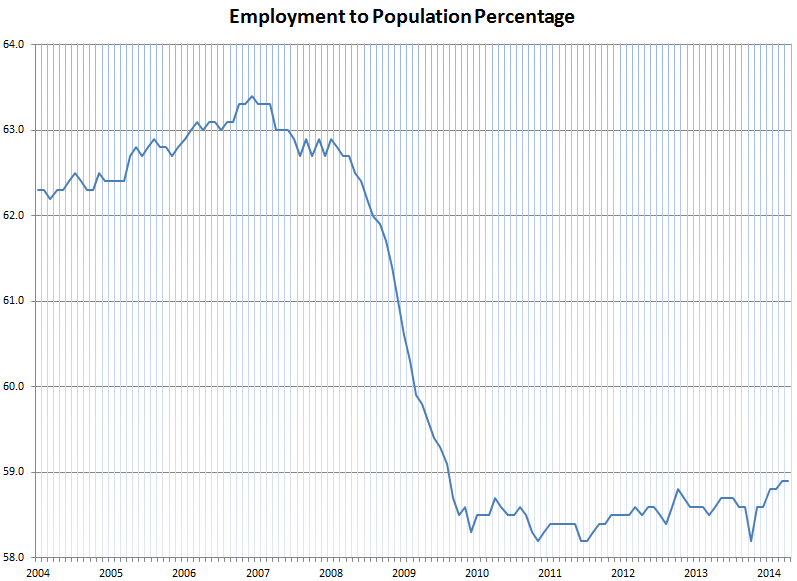 More critically for Americans, the usual pattern of a recovery from recession within a couple of years to return to a similar employment to population ratio as that prior to the recession is in no way evident. It is far more accurate to call this employment stagnation in the depths of a never-ending depression than to call this a recovery. Yet many are shouting harrahs because the so-called unemployment rate dropped in April, even as 800,000 people left the workforce. Many Americans are in the depth of despair at finding a decent job. The reports are that most of the jobs that were created in April were relatively low-paying and unskilled jobs. This is hardly surprising to me given the assertively anti-private sector policies of the Obama Oligarchy Gang of his dictatorial, individual rights trampling, Constitution ignoring, anti-energy, anti-business, micromanaging, lawless, and self-ownership denying regime. In such a chaotic environment, the private sector does not invest in new business ventures and does not hire. Obama's claims that money spent by government, which it removes from the private sector, is an investment has been tested many times throughout history. That experiment always fails to back the statist theory and has failed once again under the Obama Regime. This remains the never-ending Great Socialist Recession. Although, given its duration and the degree of human misery it has caused, it is becoming more and more nearly correct to upgrade this condition to the Great Socialist Depression of the 21st Century. The low employment, the huge transfer of wealth from the private to the government sector, the lawlessness of the government, and the rate of implementation of new socialist programs is very akin to the Great Depression of the 20th Century. This is what you get when you put government in the hands of the Progressive Elitists. For all their pretense to know better than most Americans how their lives should by micro-managed by this Progressive Elitist clique, they always manage to mess our society up royally. We Americans do much better when we insist on controlling our own lives and living them in accordance with our self-chosen values. Our standard of living is highly dependent upon our rejection of the Progressive Elitist claim that we did not make that. It is each of us as an individual who must make our own lives and must honor and protect the right of every other individual to do the same. We must fight off the usurpation of power over our lives by a power-lusting Progressive Elitist cabal. That cabal refuses to recognize our highly individualistic natures, rich in complexity and highly differentiated. It refuses to recognize our self-ownership as ObamaCare especially makes clear. It refuses to recognize our ability to use reason to improve our own lives while exercising our individual rights to life, liberty, property, and the pursuit of our own happiness. As the Declaration of Independence asserts the protection of such broad individual rights as the sole legitimate justification for a highly limited government and thereby defines the American Principle, the Progressive Elitist movement is profoundly anti-American.